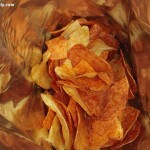 Have you ever opened up a bag of chips and noticed a couple of dark chips in the bag? Now think, what if you bought a bag of chips and it was nothing but all of those dark chips. 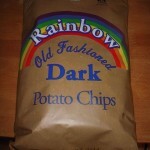 Well that is what you get with Better Made Rainbow Old Fashioned Dark Potato Chips. As you are probably well aware, I’m basically game for trying any flavor (e.g. 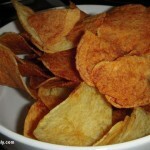 shrimp chips) or type of chips/crisps (e.g. Hawaiian taro chips). 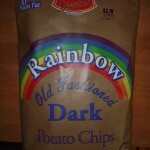 But after I read the back to the bag to find out what these Rainbow chips were all about. I have to tell you, I started to have second thoughts about what I just got myself into. But seeing how I had already bought the bag by the time I found out what these chips were all out, it was too late to back out. So what did I think of these chips? To be honest, I’m on the fence with these chips, since it’s such a unique flavor. But calling it a flavor doesn’t really do these chips justice. Since you really can’t call it a burnt taste, since technically the chips aren’t burnt, it’s only due to the potatoes high sugar content that they darken while cooking. They are just slightly sweet from the caramelization during frying, but it isn’t the traditional kind of sugar sweetness that you would think of from maybe a brown sugar or white sugar. The only way I can describe the taste of these chips is that they are a complex taste not meant for kids, when you think that all they started with was just potatoes, salt and cottonseed oil. Would I get another bag of these chips: maybe (leaning toward yes.) There is something about these chips that almost makes them the anti-chips of traditional plain chips, which is a tough concept to wrap your head around. 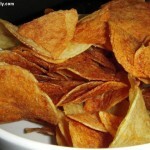 Since traditional plain potato chips are paper thin, pretty salty, light yellow in color and slightly oily. While these chips are the exact opposite in that they are close to kettle cut thickness, not salty, dark brown and not really oily. In conclusion if you are at a Busch’s or Hiller’s Market in Metro Detroit go and pick yourself up a bag, and get ready to push the limits on the concept of what you think a potato chip should taste like. Nuff said. Better Made – What are Rainbow Chips? I have tried these and loved them. My big problem is I can’t find the in the grocery stores in Lincoln, Ne. How can I order some on line? How much do they cost? Sorry don’t have any white couch’s nearby to take out my aggression on. Seems like they’d be good with dips or as an ingredient in a larger dish. They do seem much more interesting than the standard chip. Did you f*ck up someone’s couch after eating the “darkness”?